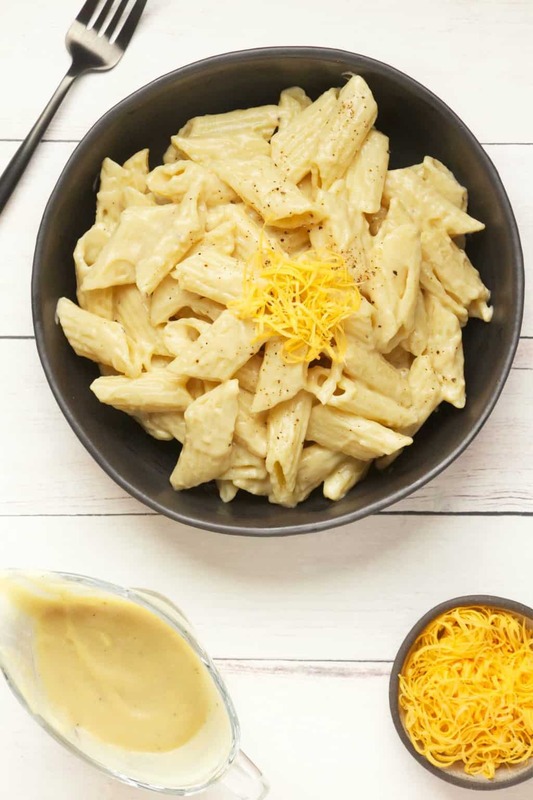 Simple and fabulously cheesy vegan cheese sauce. 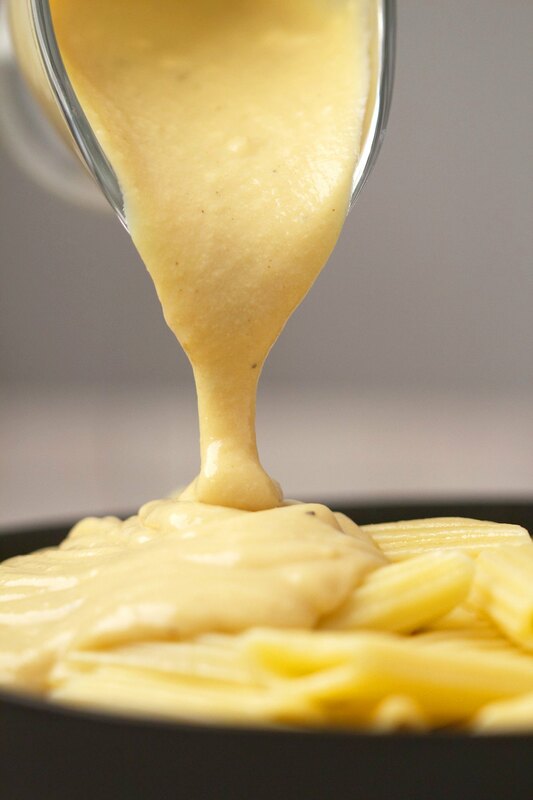 Ideal for lasagnas, pastas, vegan mac and cheese or anywhere you would usually use a cheese sauce. 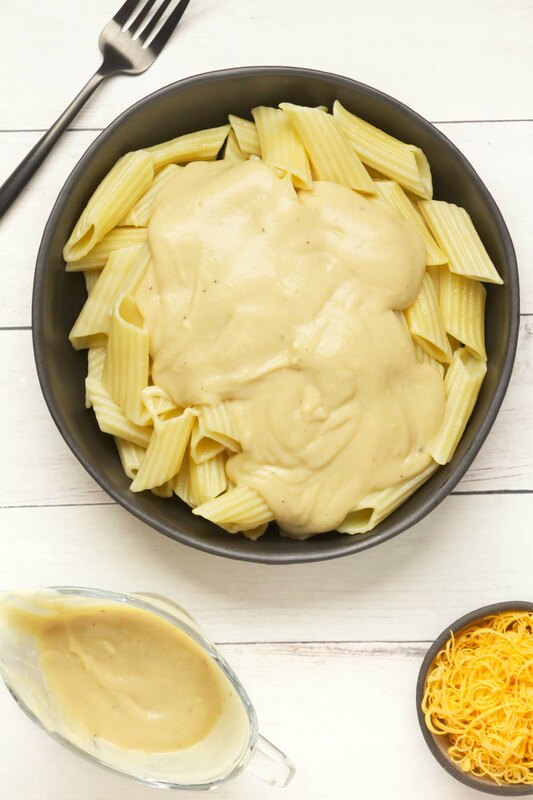 Making a vegan cheese sauce really couldn’t be easier. 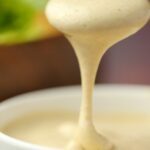 You start off with a basic vegan white sauce – also called bechamel sauce and then with just a few added extras, it magically turns into cheese sauce! There are just 3 basic ingredients – oil, flour and plant-based milk (I used soy milk) to make your basic white sauce. To that you add some salt, black pepper, dijon mustard, great for adding a cheesy flavor don’t even ask me why but really it works, and some nutritional yeast. And that might be as far as you need to go to get your perfect cheese sauce flavor! If you want to intensify the flavors a bit more, you can add in some optional onion powder and garlic powder too. This isn’t the kind of cheese sauce you’re going to use on a pizza. 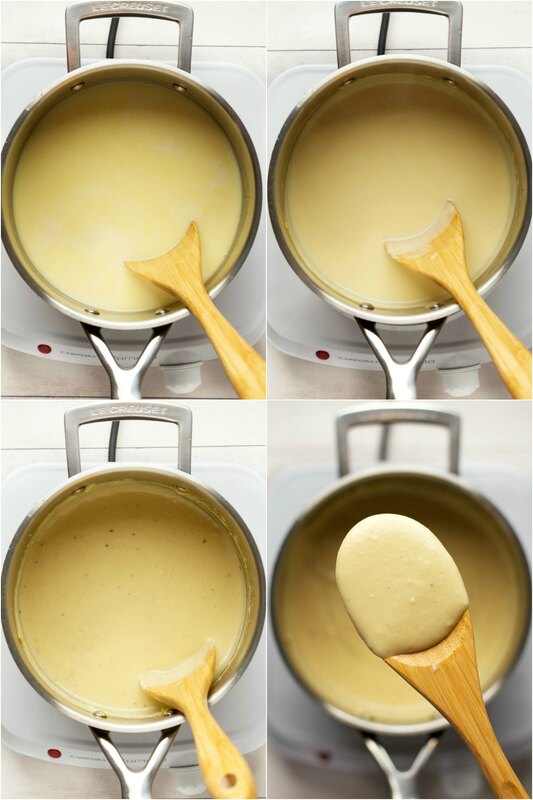 Have you had a white sauce (bechamel) before? It’s exactly like that, just flavored to be cheesy! 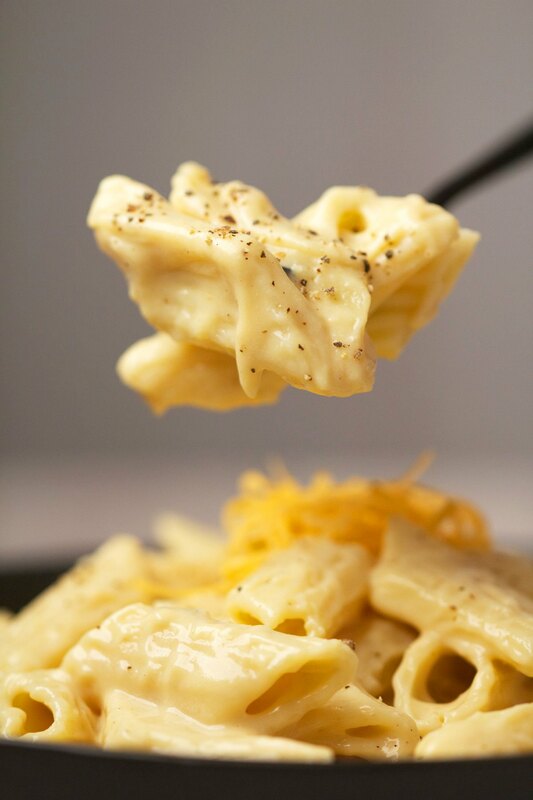 It’s what you want when you want a cheesy version of a white sauce to use in your lasagna! It’s also great as a pasta sauce or served over vegetables. It also makes a great sauce for a mac and cheese. 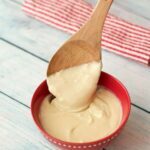 If you want a cheese sauce to drizzle on your pizza, then you’re looking for a cashew cheese sauce! Or you can even grate up some hard sliceable cashew cheese and melt it on your pizza! Keep leftovers stored in the fridge and enjoy within 4-5 days. 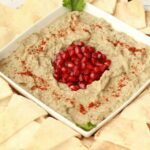 Let us know what you think of this recipe by leaving a comment and a rating! Thank you! And sign up to our email list while you’re here, you’ll get a great (and free!) recipe ebook and you’ll be the first to know when new recipes are posted to the blog! 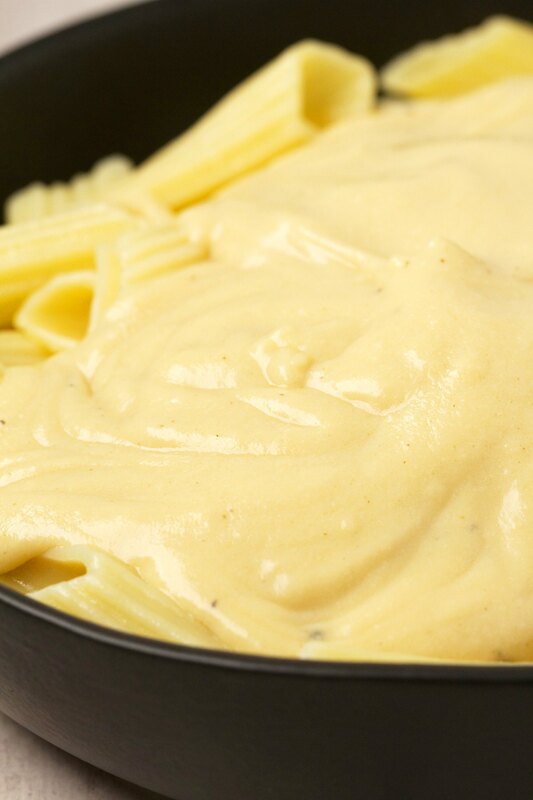 Creamy and super cheesy vegan cheese sauce recipe. 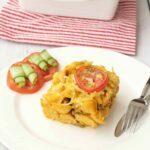 Ideal for lasagnas, pastas, vegan mac and cheese or anywhere you would usually use a cheese sauce. Nut free. Add the olive oil to a pot on the stove and turn the heat to medium high. When the oil begins to heat up, add the flour, stirring briskly all the time. Fry the flour in the oil for a bit, stirring vigorously, and then add in all the soy milk at once. Stir vigorously. Alternate with a hand whisk and a wooden spoon while it heats up to prevent any lumps from forming. Continue to stir until the sauce begins to thicken. You will usually reach the right thickness a few minutes after the sauce has reached boiling point. When it has reached the desired thickness remove from the heat (bear in mind that it will continue to thicken as it cools). Stir in the mustard, nutritional yeast, salt and ground black pepper. Taste test and see how you like it. If you want to intensify the flavors, add in the onion powder and garlic powder and stir in. 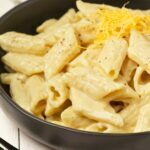 Depending on what you want to use the cheese sauce for, you may prefer it plain or you may want to intensify the flavors with the onion and garlic powders. Serve with pasta or use as a sauce in a vegan lasagna. Add some grated vegan cheese to the sauce as well if you like. *You can use different non-dairy milks with slightly different flavor results. *Adapted from my basic vegan white sauce recipe. *This recipe has recently been updated with new photos added. Hi, this looks so good. I have been looking for a cheese sauce without nutritional yeast because I am not a fan. Any substitute suggestions? Thx!! Hmmm, if you make it without the nutritional yeast but just use a bit more mustard, it can get a pretty good ‘cheesy’ flavor just from that, no idea why! I haven’t tried it with oat milk but I really think any non-dairy milk would work great here! So quick and easy! I used coconut milk and almond flour with a teaspoon of xanthan gum and it is perfect! My kids both loved it as well! I’m guessing you meant “prepared yellow mustard” as opposed to the ground mustard powder, but adding the “p” word would save us nitnoids a heap of grief! I just made it. As written, the sauce was very bland. I highly suggest adding a generous amount of paprika (1Tbsp) , garlic powder, a dash of soy sauce and extra salt. I also added a few dashes of jalepeno hot sauce because it seems to give it a fuller flavor, but it would be okay without hot sauce. I just made this and I’m really happy with the taste and consistency. I didn’t have nutritional yeast so I made it without. I added a bit of coconut-based vegan cheese and a sprinkle of nutmeg, and used oat milk instead of soya. It’s a surprisingly rich sauce so you don’t need a tonne of it! Forgot to add rating! Oops! I just made this and it was delicious! I used vegetable oil rather than olive as its what I had, and unsweetened almond milk. I mixed it with roast peppers and mushrooms, spinach and pasta. Looking forward to putting it in a lasagne next! Awesome Paula! Sounds great! It’s really good in a lasagna too. 🙂 Thanks for sharing! I love the simplicity and versatility of your recipe. It can be varied with a tweak here and there, and always with great results. I like to add a teaspoon of garlic granules and a pinch of turmeric for colour. Thank you for sharing! Amazing! I made this and your choc cookies for dinner tonight and everyone loved it. I used it to make a mac n cheese with veggies and my 6 year old veg adversed son actually ate it all. 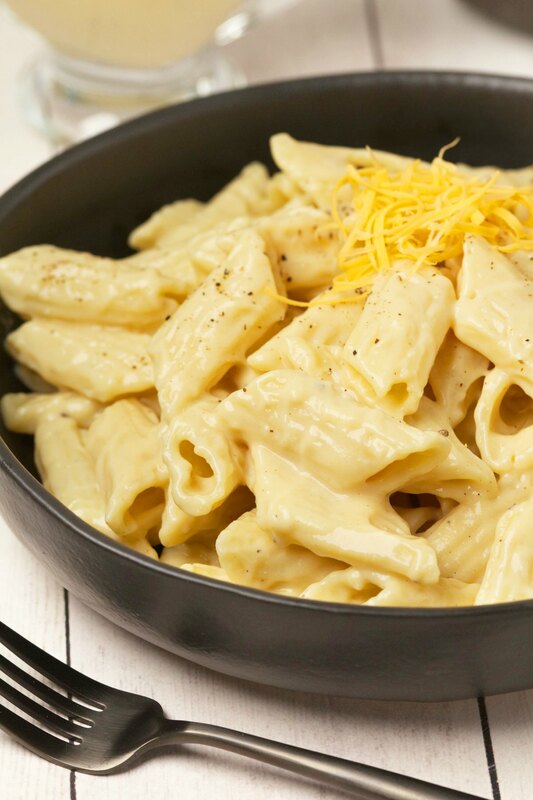 My 10yr old daughter, who thought we would have to give up cheese pasta almost cried with joy when she saw the dish. Thanks for sharing. Made this evening. As someone who has only recently become vegan, i still have the very distinct memory of what all types of cheese tastes like, and this did not taste cheesy. The nutritional yeast helped make it palatable, but the mustard is an obvious and uncheesy flavour and as a whole it just couldnt be mistaken for cheeae sauce. The mustard does add an extra welcome tang. It was nice nonetheless, and i called it “pizza drizzle sauce” when the kids asked what it was because they definitely wouldnt believe its cheese sauce. It added some flavour and topping to our pizzas and was nice enough for me to keep and freeze the leftovers for the next round of pizzas, so im not saying its a bad recipe at all. Just not cheesy. Hi Terri, this is definitely more the kind of sauce to use in a lasagna or on veggies than as a pizza sauce. It’s basically a white (bechamel) sauce flavored to be cheesy. This isn’t what I would use on a pizza at all. That would be something like my cashew cheese sauce if I wanted to drizzle it over, or my sliceable cashew cheese if I wanted to grate some up to serve on top. 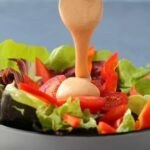 In terms of flavorings, you can play around with stronger flavorings to get more ‘cheesy’ flavor, things like onion powder, paprika, garlic powder etc can all work, just see what you like. Curious, do you have any substitute for flour…such as garbanzo bean flour..etc? Hiya, I’m going to try this very soon, looks delicious! I was wondering if you think it’s okay to freeze a portion? Hi Tasha, yes this freezes well. 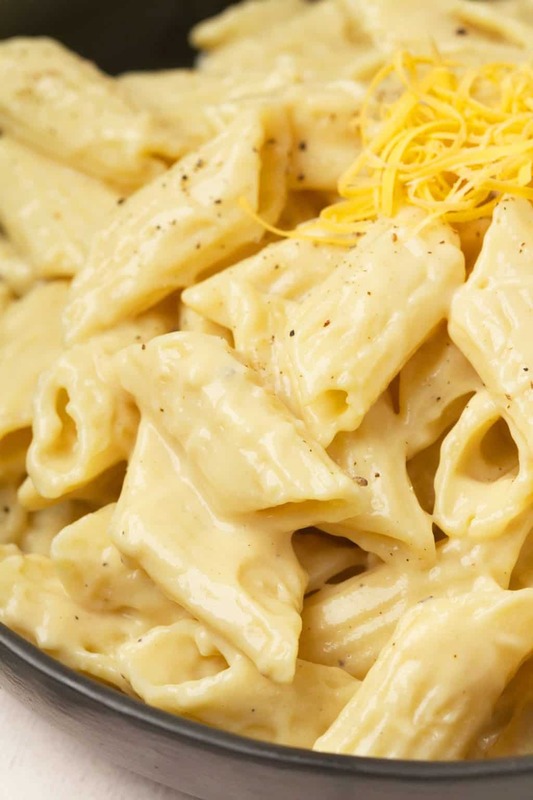 🙂 It’s pretty much a white sauce with some cheese flavoring, so the info in this article will apply to freezing this. I really liked this over pasta and broccoli. Do you think this could be made into a nacho sauce, and if so, how? Thanks! My sauce just doesn’t thicken, what am I doing wrong????? Hi Jordan, did you substitute any of the ingredients? Usually this sauce is quite forgiving, if it’s a little thin you can just cook it for longer, and it will thicken up. Alternatively, you can troubleshoot it by adding some flour (about a tablespoon will be good) to a little cold non-dairy milk and whisking it into a paste and then adding that in to the hot sauce and whisking it in very well. It could be that the ratio of flour was a little off and you just need a touch more. My usual practice though would be just to cook it for longer until it thickens and then let it thicken more as it cools. 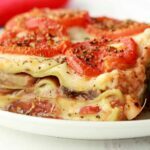 I made this and tried it as a bechamel sauce – YUMMY!! Cant wait to use it in lasagne. Then i added mustard , nutritional yeast, salt, pepper, paprika, vinegar, garlic powder and tumeric for colour and it became the ultimate cheesy sauce. I think it tastes better than the real thing!! Thank you for the recipe Alison!! !